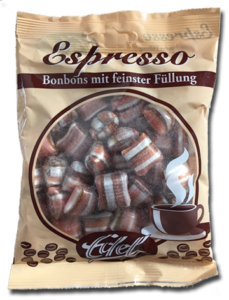 Home » 5 Freshest » Espresso Bonbons mit feinster Fullung. Pass. And Not as in ‘Not Fail’. 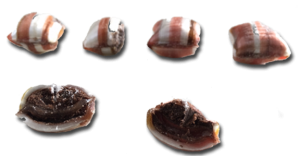 We get candy from various sources and then we eat them and then we review them. Simple. Sometimes they are amazing. Like these! Locachas! 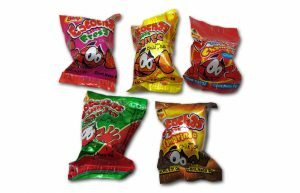 Those Mexican candies are F(*%ing AMAZEBALLS. Really. I can’t say enough nice things about them. You should buy them right now. Stash them. Give them to friends. Buy more. Now, don’t take this as a slight to the wonderful people who send us candy from afar – because we love those people. Just sometimes the candy they provide is… less than stellar. Let’s take a closer look at these Espresso Bonbons mit feinster Fullung. And that’s it for the positive. — with their semi-soft center and hard-yet-thin-ish shell. Plus they really do smell like coffee. But they don’t taste like it. They don’t taste like espresso. Which is their NAME. The flavor is more like a light-hearted fan-art version of espresso made by a 10 yr old who has never had espresso before. Where I wanted heavy coffee overtones, I got a barely light java essence. And these are sweet. Too sweet, with no depth. They’re boring gramma candy. Sorry gramma. That’s actually not very nice. So leave these off your ‘to buy’ list, which will be easy good because I scoured the interwebs and could only find one site that references these. There’s no way to buy there – I think it’s about the package design, which is nothing to make a web page about either.